If you had a 3-Step Easy Client Re-Booking system, would that make your life a lot better? Many therapists struggle with how to ‘encourage’, ‘get’, ‘convince’ clients to return for more than 1 or 2 visits, so they resort to selling discount packages (as taught by many other mentors or educators). Stop trying to convince people — you’re NOT in the convincing biz! 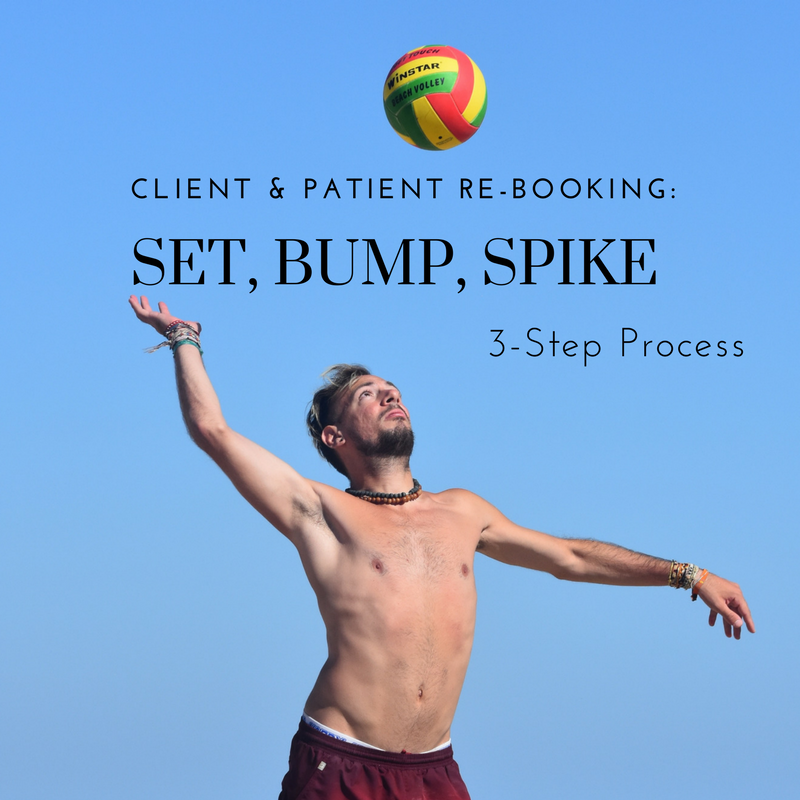 Today, I’ll teach you how to get repeat bookings and encouraging patients to follow through on therapy plans using a 3-Step Easy Client Re-Booking process, with a volleyball analogy — bump, set, spike… (except the 3 steps are re-ordered). There are 3 steps to set it up so your patient understands **from the beginning** how you ‘run’ your practice and what is expected. The first phone call or conversation/consult is where you find out their goals, briefly discuss their symptoms and determine together if you’re a match for each other. If you already can tell it will take more than 1 or 2 sessions to get them their results, you let them know that EVEN BEFORE their first visit. Through your entire on-boarding process, reinforce in their mind the possible need for more than 1 or 2 visits or more (if it’s true). After the session at the front desk you or your front desk person confirms the need for future visits based on their clinical needs. YOU determine the frequency, duration, etc you see is best for them. Give this 3-Step Easy Client Re-Booking system a try when your next new client or patient calls or walks in to inquire about your services. Post your thoughts below so we know what YOU do to respectfully encourage patients and clients following through on your suggested therapy plan!